I didn't plan anything special for today being all eleventy-one, but I did try out my new magnetic polish, so I guess that is what I will remember for the date 11-11-11. I have Layla Magneffect polish in Silver Galaxy here, and I used both the magnet in the cap that it came with and the star magnet from my LCN polish set. The design forms quickly under the magnet and the polish does not seem to dry as quickly as the LCN formula does. It responded just fine to the star magnet, and I found that it was easy to use the Layla magnet on the cap to create lines. I tried them both diagonally and just straight. My pinky was not magnetized and thus looks simply grey. As always the polish is fun to wear with it's ever-shifting magnetic design. 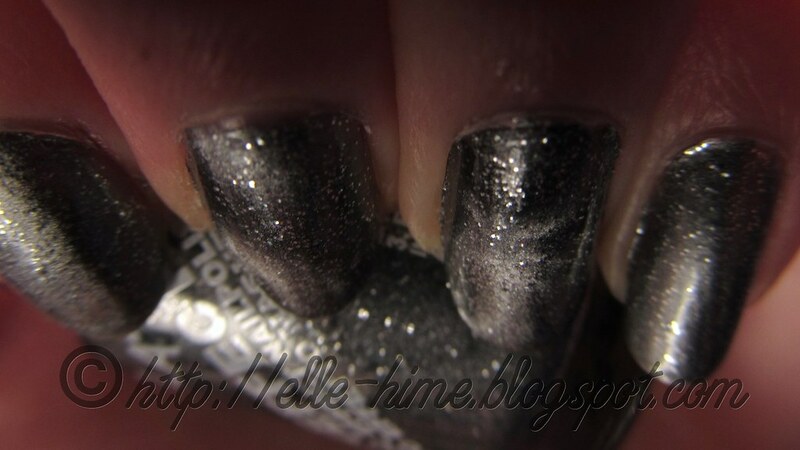 The glitter distributes evenly over the nail and is not effected by the magnet. I used a top coat and only have very slight tip wear after 24 hours of it being on my nails. The bottle is 10ml and has a sticker wrapped around the cap to label it. The bottle itself is imprinted with instructions for use that are a little unclear. The line across the magnet denotes which direction your magnetized lines will go. Because this is my first of the Layla brand I'm not sure if all the Magneffect polishes have the thinner quality that Silver Galaxy does, but it's nothing that being applied over a dark opaque polish couldn't fix. The slower drying time meant the designs came out sharply and overall felt more forgiving (though you still need to work quickly, and do one nail at a time). For someone who would like to try out magnetic polish I would recommend getting a bottle of Layla Magneffect - they offer 12 colors but currently only a line-type magnet. I hope that this was helpful to you. Anyone have a suggestion of what Layla color(s) I should try besides Silver Galaxy? If there are any questions feel free to ask in the comments below!